When I was in grad school at the University of Washington, there was an Indian restaurant not far from campus and it was without a doubt one of my favorite places to grab a bite to eat. To this day Indian food brings memories of those grad school years and every now and then I yearn for those flavors. The spices used in Indian cuisine are so deep and aromatic that when you decrease fat content in recipes or make a few ingredient swaps, you certainly don’t lose out on the flavor! 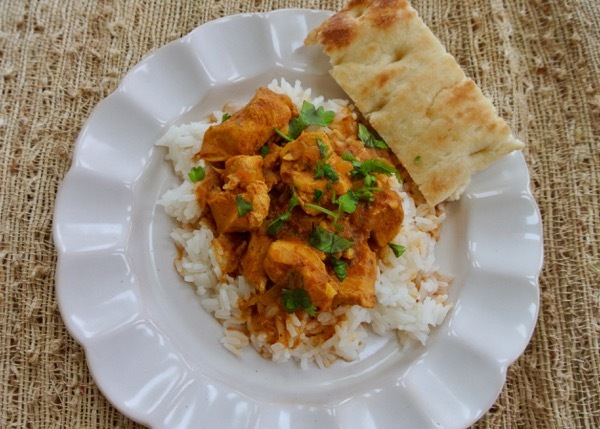 My children are not as adventurous when it comes to Indian recipe and their favorite standby menu item is always Butter Chicken (Chicken Makahni) as it is creamy, flavorful and mild. Traditionally cooked, the sauce is started with butter and then finished with butter or cream. In this modified recipe we use a little olive oil to sauté the onions and garlic and the sauce is finished with yogurt to add some creaminess to it. We kept it on the mild side for the whole family but feel free to increase the chili powder or even Anaheim chiles for some added heat. The slow cooker was used as we are in prime soccer season and that means we get a lot of slow cooker use on those busy nights juggling homework, soccer trainings and games. 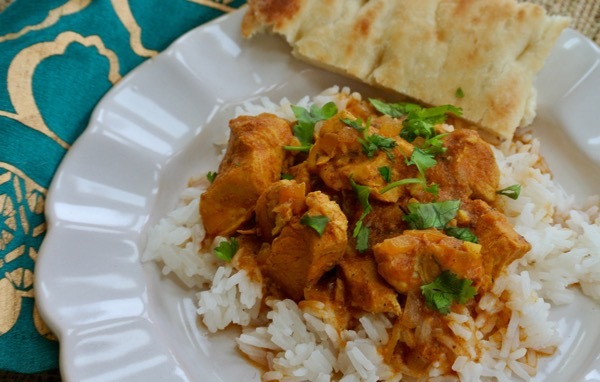 You can serve this dish over brown rice and with a slice of whole grain naan bread to soak up the delicious sauce. A traditional recipe was lightened using light coconut milk, no butter and adding yogurt in place of cream. Plenty of good-for-you, flavor enhancing spices were used to pack a lot of flavor. Warm the olive oil in a medium saucepan over medium heat and add onions, garlic and ginger root stirring frequently until the onion is tender and translucent. Add the garam masala, cumin, curry powder, tumeric, chili powder and stir until the spices become fragrant. Add the coconut milk and tomato pastes and stir well until sauce is combined well. Place the chicken pieces in the bottom of a slow cooker and add the sauce over top stirring to cover the chicken in sauce. Cover with the lid and cook on low for 5 hours. About 10-15 minutes prior to the end of the cooking time, add the yogurt and stir well to combine and until heated through and season lightly with salt and pepper. Sprinkle chopped cilantro leaves on top of chicken and serve over rice.